Manual fills allow you to track trades not placed through a traders' X_TRADER workstation. From the SODs/Manual Fills window you can create and offset manual fill records. You can not modify a published manual fill. You may only alter manual fill data prior to publishing, or you can create a new manual fill to offset the one you published previously. You can also enter a manual fill from the Fills Pane Context Menu. Tip: You can also drag-and-drop an instrument from the Market Explorer window to create a new manual fill record for that instrument type. From the Control Panel, click the icon. The SODs/Manual Fills window displays. Within the empty record at the bottom of the window click to select Admin Fill or Local Fill from the SOD/MF column. X_RISK also requires you to include user information in a manual fill record. To meet this requirement click to select one from the Username column. Click the button and use the Using the Instrument Explorer. Manually enter the Exchange, Product Type, Product, and Instrument. Enter the quantity, price, and if the order is a Buy (B) or Sell (S). You successfully entered manual fills. A Start of Day record (SOD) is the summary of the net position that a trader had on a specific contract during the previous trading session.From the SODs/Manual Fills window you can create, modify, delete, and publish start of day records. Within the empty record at the bottom of the window click to select SOD from the SOD/MF column. X_RISK also requires you to include user information in a SOD record. To meet this requirement click to select one from the Username field. Note: If you leave the price value blank it will create the SOD with the previous session's settlement upon publish. You successfully created a start of day record. Tip: You can also drag-and-drop an instrument from the Market Explorer window to create a new start of day record. From the desired start of day record, modify the B/S, QTY, and Price fields as needed. Note: You can only modify the B/S, QTY, and Price fields after an SOD has been published. If changes to other fields are required, you should delete the existing SOD and create a new one. You successfully modified a start of day record. Offsetting a manual fill creates a new record that neutralizes (Buy against Sell or Sell against Buy) the selected fill. For example, if you select a 5-lot Buy, the offsetting manual fill will be a 5-lot Sell for the same trader and on the same contract. Fields other than B/S (Buy/Sell) are identical between the original fill and the offsetting fill. Like manual fills, you must publish offsetting manual fills. Select the manual fill you wish to offset, and right-click. The context menu displays. Click Offset Fill. The offsetting fill record appears. Click the Publish button to save your changes. You successfully offset a manual fill. You can delete an SOD record in order to remove it from X_RISK, as well as from the trader's X_TRADER workstation. To do so, you must remember to click the Publish button after the row is removed from the SODs/Manual Fills window. Click to highlight the row(s) you wish to delete. Hold down Shift to select multiple rows. Right-click on the selected row(s). The context menu displays. Click Delete. The Delete Confirmation dialog box appears. Click Yes. The SOD is removed. You successfully deleted start of day records. You can delete local manual fill, but can only delete broadcast manual fills that have not been published (which removes the manual fill row from the display). Note: To correct an error you can Offsetting a Manual Fill broadcast manual fills that have been published. Right-click on the highlighted row(s). The context menu displays. Click Yes. The manual fill is removed. You successfully deleted a manual fill. 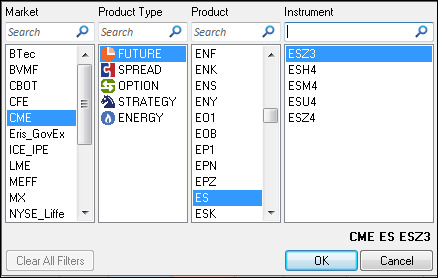 The Instrument Explorer allows you to quickly locate and select both exchange listed and locally defined instruments. The instruments available will automatically update depending on the Exchange, Product Type, and Product selected. Note: To further filter the results, enter text in the Search text box located at the top of each column. From the Exchange column, click to select an exchange. From the Product Type column, click to select a product type. From the Product Column, click to select a product. From the Instrumentcolumn, click to select an instrument. You successfully selected a contract using the Instrument Explorer.